One of the confusing things to entrepreneurs, investors and educators is the relationship between customer development and business model design and business planning and execution. When does a new venture focus on customer development and business models? And when do business planning and execution come into play? Here’s an attempt to put this all in context. One of the issues that came up is whether the new lexicon of entrepreneurial ideas – Customer Development, Business Model Design, Lean, Lean LaunchPad class, etc. – replace all the tools and classes that are currently being taught in entrepreneurship curriculums and business schools. I was a bit surprised since most of what I’ve been advocating is complementary to existing courses. 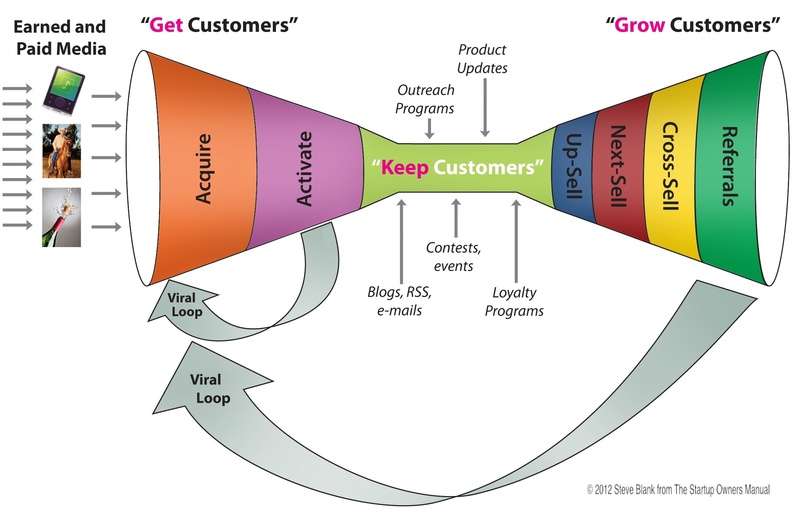 However, I realize I’ve primarily written about business model design and customer development. Given that I’m speaking this month in front of entrepreneurship educators at the NCIIA conference, I thought I should put it in context before they throw tomatoes at me. One of the things startups have lacked is a definition of who they were. For years we’ve treated startups like they are just smaller versions of a large company. However, we now know that a startup is a temporary organization designed to search for a repeatable and scalable business model. Within this definition, a startup can be a new venture or it can be a new division or business unit in an existing company. If your business model is unknown – that is just a set of untested hypotheses- you are a startup searching for a repeatable business model. Once your business model (market, customers, features, channels, pricing, Get/Keep/Grow strategy, etc.) is known, you will be executing it. 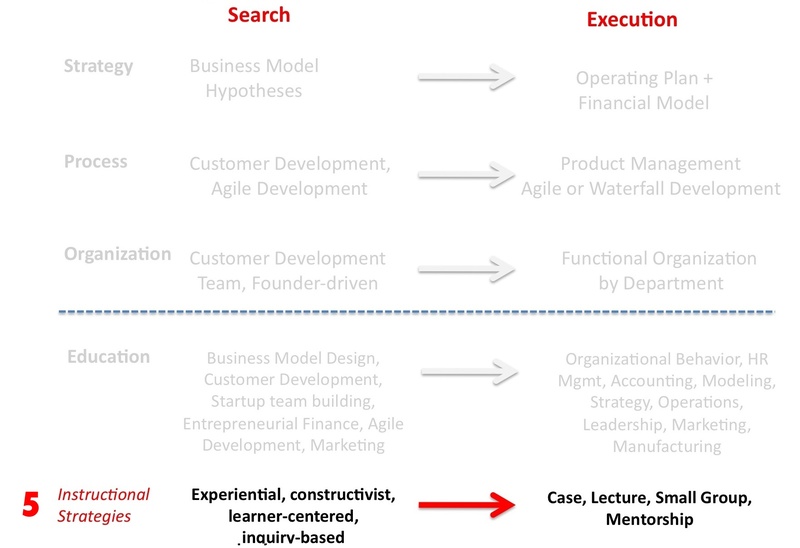 Search versus execution is what differentiates a new venture from anexisting business unit. The primary objective of a startup is to validate its business model hypotheses (and iterate and pivot until it does.) Then it moves into execution mode. It’s at this point the business needs an operating plan, financial forecasts and other well-understood management tools. The processes used to organize and implement the search for the business model areCustomer Development and Agile Development. 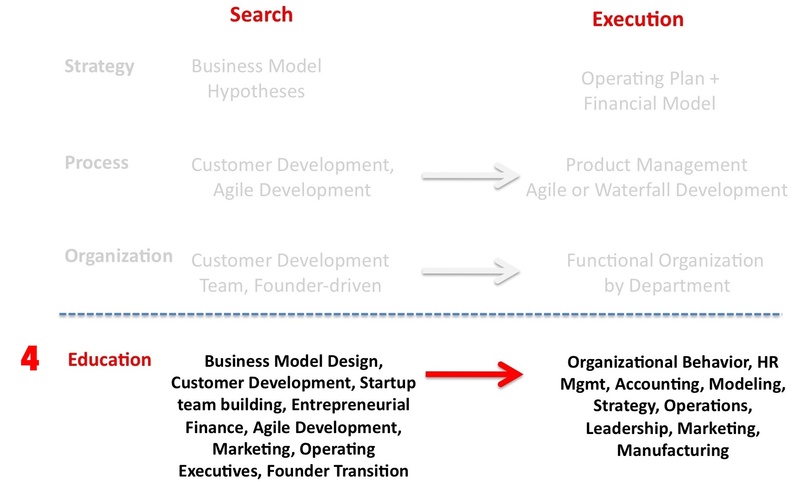 A search for a business model can be in any new business – in a brand new startup new or in a new division of an existing company. In search, you want a process designed to be dynamic, so you work with a rough business model description knowing it will change. The model changes because startups use customer development to run experiments to test the hypotheses that make up the model. And most of the time these experiments fail. Search embraces failure as a natural part of the startup process. Unlike existing companies that fire executives when they fail to match a plan, we keep the founders and change the model. Once a company has found a business model (it knows its market, customers, product/service, channel, pricing, etc. 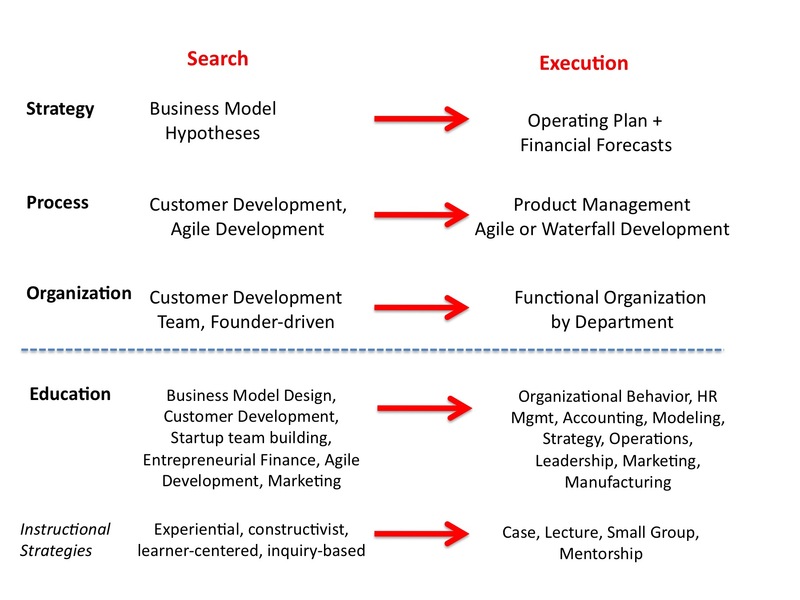 ), the organization moves from search to execution. The product execution process – managing the lifecycle of existing products and the launch of follow-on products – is the job of the product management and engineering organizations. It results in a linear process where you make a plan and refine it into detail. The more granularity you add to a plan, the better people can execute it: aBusiness Requirement document (BRD) leads to a Market Requirements Document (MRD) and then gets handed off to engineering as a Functional Specifications Document(FSD) implemented via Agile or Waterfall development. Companies in execution suffer from a “fear of failure culture“, (quite understandable since they were hired to execute a known job spec.) Startups with Customer Development Teams have a “learning and discovery” culture for search. The fear of making a move before the last detail is nailed down is one of the biggest problems existing companies have when they need to learn how to search. Entrepreneurship curriculums are only a few decades old. First taught as electives and now part of core business school curriculums, the field is still struggling to escape from the bounds of the business plan-centric view that startups are “smaller versions of a large company.” VC’s who’ve watched as no startup business plan survived first contact with customers continue to insist that startups write business plans as the price of entry to venture funding. Even as many of the best VCs understand that the business ‘planning’ and not the ‘plan’ itself, are what is important. Entrepreneurship educators have realized that plan-centric curriculum may get by for teaching incremental innovation but they’re not turning out students prepared for the realities of building new ventures. Educators are now beginning to build their own E-School curriculum with a new class of management tools built around “search and discovery.” Business Model Design, Product/Service Development, Customer Development, Startup Team-Building, Entrepreneurial Finance, Marketing, Founder Transition, etc. all provide the startup equivalent of the management tools MBAs learn for execution. Entrepreneurial education is also changing the focus of the class experience from case method to hands-on experience. Invented at Harvard, the case method approach assumes that knowledge is gained when students actively participate in a discussion of a situation that may be faced by decision makers. The search for a repeatable business model for a new product or service is not a predictable pattern. An entrepreneur must start with the belief that all her assumptions are simply hypotheses that will undoubtedly be challenged by what she learns from customers. Analyzing a case in the classroom removed from the realities of chaos and conflicting customer responses adds little to an entrepreneur’s knowledge. Cases can’t be replicated because the world of a startup too chaotic and complicated. The case method is the antithesis of how entrepreneurs build startups – it teaches pattern recognition tools for the wrong patterns – and therefore has limited value as an entrepreneurship teaching tool. The replacement for cases are not better cases written for startups. Instead, it would be business model design – using the business model canvas as a way to 1) capture andvisualize the evolution of business learning in a company, and 2) see what patternsmatch real world iterations and pivots. It is a tool that better matches the real-world search for the business model. An entrepreneurial curriculum obviously will have some core classes based on theory, lecture and mentorship. There’s embarrassing little research on entrepreneurship education and outcomes, but we do know that students learn best when they can connect with the material in a hands-on way – personally making the mistakes and learning from them directly. As much as possible the emphasis ought to be on experiential, learner-centric and inquiry-based classes that help to develop the mindset, reflexes, agility and resilience an entrepreneur needs to search for certainty in a chaotic world. « Does White identity predict positive or negative attitudes towards diversity?